Improve work systems for the procuratorate upholding Party leadership. 健全在检察工作中发挥党组领导核心作用、党组成员依照工作程序参与重要业务和重要决策等制度。严格执行检察机关党组向党委请示报告重大事项的规定,健全检察机关重大事项和办案工作党内请示报告制度,实现党对检察工作的领导具体化、程序化、制度化。 Improve systems and mechanisms for procuratorates of directly controlled municipalities leadership of branch procuratorate Party organizations. Improve systems for political inspections and tours. Establish systems for political oversight of the procuratorate. 加强检察机关基层党组织建设,以提升组织力为重点,突出政治建设功能,优化组织设置,创新活动方式,充分发挥基层党组织战斗堡垒作用和党员先锋模范作用。 Persist in establishing temporary Party organizations for the front line in handling major cases. (2) Establish and improve systems for the procuratorate's legal oversight. Improve work mechanisms for review of arrests. 全面科学把握逮捕条件,完善逮捕必要性审查机制,依法保障犯罪嫌疑人合法权益。建立有重大影响案件审查逮捕听证制度,健全讯问犯罪嫌疑人、听取辩护人意见工作机制。 Improve systems for reviewing the necessity of detention, reducing unnecessary detention. Improve procuratorial work mechanisms for criminal enforcement. 建立对监狱、看守所的巡回检察制度,把巡回检察与派驻检察结合起来,强化刑事执行检察力度和效果,保障被羁押人、服刑人员合法权益,维护监管秩序,促进监管场所把罪犯改造成为守法公民。完善刑事执行检察与审查逮捕、审查起诉等工作的衔接机制,驻所检察人员在履职过程中发现有刑讯逼供等情形的,及时反馈负责审查逮捕、审查起诉的办案人员。 健全财产刑执行检察工作机制,推动建立与人民法院财产刑执行案件信息、执行信息共享机制。 Explore improving mechanisms for inspection of community corrections. 健全刑事申诉案件受理、移送、复查机制。完善不服检察院处理决定刑事申诉案件复查工作机制,完善不服法院生效裁判刑事申诉案件复查工作机制,规范刑事再审案件出庭工作。健全纠防冤错案件工作机制。 Improve mechanisms for public review of collateral appeals in criminal cases. Deepen work mechanisms for remote reviews of major wrongfully decided criminal cases. 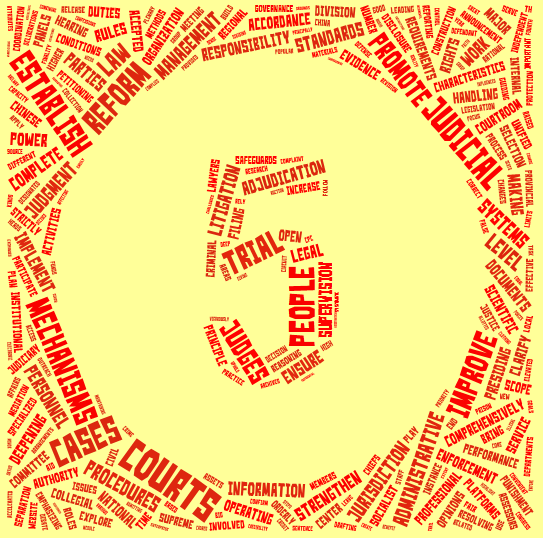 Improve systems for analysis and reporting on criminal appeals cases. 完善申诉事项回复、督办机制,实现每一个申诉事项都有回复。 Improve mechanisms for the oversight of state compensation and judicial assistance work. Improve work mechanisms for public interest litigation. 全面贯彻民事诉讼法、行政诉讼法关于公益诉讼的规定,完善检察机关提起公益诉讼工作机制。充分发挥诉前程序作用,建立健全诉前沟通机制,收到案件线索后,根据线索的来源、涉及问题的性质等因素,及时与政府部门进行沟通,需要进入诉前程序的,依法发出检察建议并努力协调促进落实。 在办理公益诉讼案件过程中,需要对专门性问题进行鉴定的,可以委托具备资质的机构进行鉴定,配合有关部门探索制定环境损害司法鉴定收费“后付费”制度。 健全人民检察院与人民法院、行使行政执法权的机关工作协调机制,建立行政执法与公益诉讼衔接平台,进一步规范公益诉讼办案流程和标准,构建配置科学、运行高效的公益诉讼检察机构职能体系。 Improve mechanisms for procuratorate support and urging of law suits. (3) Improve systems for utilizing the procuratorial power. Improve systems for the selection of quota procurators and disclosures in procurator selections. 细化和统一检察官遴选条件、标准和程序,明确禁止入额情形,在坚持政治标准的基础上,突出对办案能力、司法业绩、职业操守的考察,确保入额检察官的专业能力水平。完善从律师、法学专家中公开选拔检察官制度,优化检察官队伍结构。 Explore systems for selecting across procuratorates in the same region. Establish mechanisms for dynamic management and removals from the procuratorate personnel ration system. 以省(自治区、直辖市)为单位,在中央规定的范围内,严格控制检察官员额比例。综合考虑办案数量与区域经济社会发展、人口数量等因素,遵循以案定额和依职能定额相结合的原则,建立员额统筹管理、动态调整机制,在省域总额范围内明确辖区各检察院员额控制的具体比例,确保员额向人均办案量大且案多人少矛盾突出的地区、单位倾斜,向基层一线倾斜。 Establish and complete mechanisms for removal or procurators from personnel ratios, clarifying the requirements and procedures for withdrawal. 推行符合检察人员职业特点的司法人才储备、招录和法科学生实习制度。探索实行符合司法人员职业特点的招录制度。 完善检察官到政法院校、科研机构兼职担任教授,法学专家到检察院挂职担任检察官制度。 Explore the establishment of 'green channels' leading legal professionals to work at the procuratorates. 探索检察机关与党政部门、其他执法司法机关、重点企业互派干部任职、挂职交流制度。 Establish systems making it routine for students studying law and jurisprudence to intern and assist at the procuratorate. Complete and strengthen mechanisms for the establishment of ideology and politics, and for professional ethics. 在干部选拔任用、检察官遴选、等级晋升工作中加强政治把关,完善政审工作机制。建立健全检察官入职晋级宣誓制度。 弘扬新时代检察职业精神,大力培育践行“忠诚、为民、担当、公正、廉洁”的检察职业道德,完善检察职业道德考核评价机制,把职业道德素质作为检察人员招录、任免的重要标准。 Complete systems of procuratorate medals and honors.